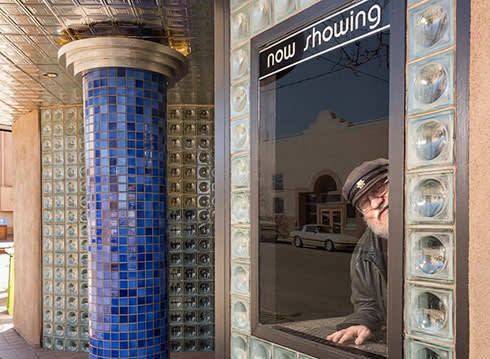 In late December 1979, 24-year-old writer and English instructor George R. R. Martin navigated his dusty car across the New Mexico state line near Tucumcari, after a long road trip from Iowa. He landed in Santa Fe, and 35 years later, he’s still here. Only now he isn’t a teacher, but the international best-selling author of A Song of Ice and Fire, a fantasy series that has morphed into a cultural phenomenon fueled by the hit HBO drama Game of Thrones. In April of last year, Martin made another big move that would further anchor him to Santa Fe. He purchased the Jean Cocteau Cinema. Once a unique cultural touchstone and social hub in the city, the prized movie house had gone dark nearly a decade earlier, and had not served as a proper community movie house. Martin wanted to revitalize it. Located in Santa Fe’s historic Guadalupe district, one of the city’s oldest Spanish Colonial neighborhoods, the Jean Cocteau is tucked inside a structure built in 1910. “It was once a huge fruit-and-vegetable emporium,” Martin says. “Since it was right at the end of the tracks in the Railyard, trains could unload their produce right next to the building.” It also served as a brewery and a Dr. Pepper bottling plant. The allure of the Jean Cocteau in its early days had a lot to do with timing. Large cinemas and cineplexes were overtaking the moviegoing landscape throughout the Southwest, threatening drive-in theaters and small movie-house operations. By the early 1980s, art-house, foreign, and fringe cinema were as important to Santa Fe’s enduring, sometimes anti-establishment, creative scene as Easy Rider was to early-seventies counterculture. Small theaters cultivated a special sense of community. As novelist-filmmaker Stephen Chbosky recently observed, today’s cinemas provide “living proof” that no one is alone. of Santa Fe movie houses like the Jean Cocteau. Martin’s initial thought after the purchase of the Jean Cocteau was to simply bring back the movie theater to its former glory, both aesthetically and functionally. Known for its diverse film programming and legendary Parmesan cheese–dusted popcorn, the 127-seat theater screened everything from classics and art-house titles to Woody Allen movies. “I did figure, with me owning it, that we would show more science fiction and fantasy, because that’s what I’m known for,” Martin says. Martin called on an old friend, founder of the Santa Fe Film Festival and longtime film critic Jon Bowman. A veteran of film programming who took his first job at the now-closed Silver Dollar Twin Drive-In movie theater in Albuquerque, Bowman’s knowledge and experience dovetailed perfectly with Martin’s vision. Bowman, who worked as an associate editor and associate publisher for New Mexico Magazine for 26 years, first met Martin in Santa Fe in the early eighties through a mutual friend, and the two kept in touch. Martin wanted to feature the 1956 sci-fi classic Forbidden Planet and Jean Cocteau’s 1950 art-house masterwork, Orpheus, at the grand reopening. These films eventually hit the screen on opening night last August, but before they did, the theater went through a major overhaul. Counters and floors in the lobby were reconfigured and redesigned with art-deco panache. Restrooms were upgraded. A new digital projector was installed, as was a new projection screen. The film projectors were saved for future screenings of special 35 mm prints. By the time the Jean Cocteau shuttered in 2006 while under the ownership of the Trans-Lux Corporation, most of the tenants in the building that housed it had vacated. Martin could have leased the space, but it made more sense to him to buy the building and fill it with tenants. The Jean Cocteau was a neighborhood spot, and the more local businesses that surrounded it, the better for everyone involved, he thought. He was right. The building is now almost 100 percent occupied with retailers, as well as the Wild Hare Salon. The real gamble would be figuring out how to succeed as a movie theater in a smallish city already flush with screens. Unlike a plot point in an episode of Game of Thrones, one could not simply behead the competition and move on. Instead, Martin and his team had to transform the Jean Cocteau into what it is today, a small events center that celebrates film, pop culture, and the visual arts with offerings that appeal to locals and visitors of all ages. The film roster is varied and includes everything from classics, such as the obligatory 1975 cult musical comedy The Rocky Horror Picture Show, to free screenings of the Game of Thrones series—a local phenomenon featuring appearances by cast members and costumed audience members (attendees line up for hours, and sometimes days, for tickets). In March, Back to the Future and Back to the Future II were on the bill. To promote the flicks, Martin had sci-fi author Ernie Cline park his 1980s DeLorean sports car in front of the theater, and then invited patrons to have their pictures taken with it. Besides film, the Jean Cocteau also celebrates one of Martin’s biggest passions—books. Internationally renowned sci-fi/fantasy authors such as Joe R. Lansdale, Neil Gaiman, and Megan Lindholm regularly appear at the theater for readings, signings, and panel discussions. “The author events seemed natural to me,” Martin says. “They’ve been some of our most popular events. The space is an exclusive bookstore, too. We only sell books signed by the authors, all of whom, including myself, have appeared here.” Rows of signed works, as well as quirky Game of Thrones merchandise, line one wall of the theater lobby. Diehard fans and collectors: Your chariot awaits. When asked why someone of his stature and fame would gamble on a closed cinema house in a town that boasts more movie screens per capita than most large cities do, Martin replied that he was simply a fan of films, and of the movie theater and its history. If not him, who? The Jean Cocteau is an expression of Martin’s creative passions that exist beyond the act of drafting a novel. Authoring books, though, is still his first love. Senior editor Rob DeWalt is a 30-year patron of the Jean Cocteau Cinema.